Lakota Medicine Wheel earrings crafted by yours truly. Lakota women are known for their quillwork and beadwork, whereas Lakota men typically design buffalo hide clothing with paintings and peace pipes. As well as jewelry, Lakota people bead saddle blankets, moccasins and other clothing. This beadwork typically stretches across the full span of the article of clothing. There is extreme attention to detail because of this. Quills, natural dye and beads are very commonly used in beadwork. Before glass beads were introduced, quills were dyed naturally and were used as the beads. The 1830s marked the decade where quillwork switched to glass beadwork. Lakota people tend to work with beads using the stich entitled “the lazy-stitch”, which isn’t actually lazy at all. This simply means that they work directly onto the piece of leather as opposed to working separately and then sewing the beadwork on at a later time. Beadwork frequently incorporates symbols of religion such as turtles, as well as nature and landscapes. As well, beadwork is centrally focused around geometric shapes and lines and uses primary colors. Primarily colors were the main colors used initially, but greens and blues were introduced later on, in addition to glass beads. Yellow: Stands for East, the direction of the sun. It also stands for understanding and wisdom because yellow represents light, which helps us to see things for what they really are. White: Stands for the North. It also stands for air and the cold winds. These winds can be considered cleansing, renewing the energy. White represents the hardships that people have to go through to reach a new energy or sense of self. Black: Stands for the West, where the sun sets. Black represents the earth in a physical sense. It also signifies introspection and insight into the larger scheme of the world. Red: Stands for South or the southern sky. This is because the southern sky is where the sun is at its highest. It also represents warmth and growing. These primary colors are used in the Lakota cross or medicine wheel; there is much variance in the direct meanings of the colors and the directions they signify. This difference is a result of legends and stories being told many times and a discrepancy of facts between the storytellers. The circle of the medicine wheel represents a sacred boundary of the earth and is referred to as the sacred hoop or a sun dance circle. 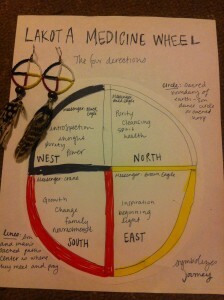 The lines in the medicine wheel represent the sun and man’s sacred path through life, meeting in the middle in prayer. Feathers in jewelry and other crafts are also very important to the Lakota people because of their spiritual significance. 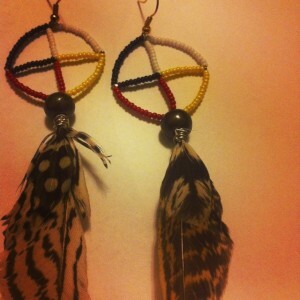 Feathers are also frequently incorporated with the medicine wheel, signifying power and the Great Spirit. 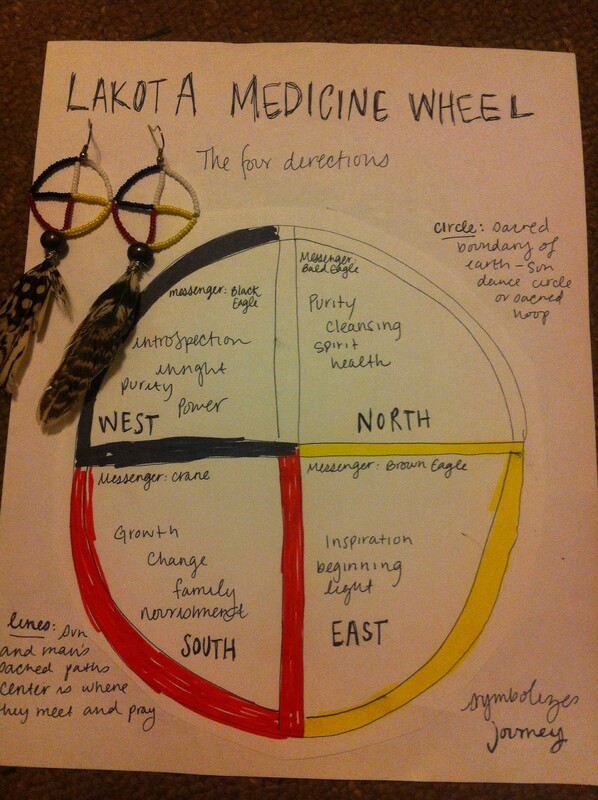 The medicine wheel is used to represent knowledge of the universe. It is used as a sacred space, and aid for meditation, a device of concentration, a symbol to honor mother earth, a protector and as an altar.